The tour simply gratifies a Biker's dreams which is to bike through the exhilarating terrains of the mighty Himalayas and pass through the beautiful landscapes and rough patches. Explore Ladakh by Bike Tour takes care of the dreams and desires of biking aficionados and is completely filled with thrill and adventure. During this eleven days tour, the nature and harmony will be your best partners and the tour would completely revitalize and rejuvenate yourself. www.travelmyntra.com offers you an ultimate experience to fulfil your thirst to experience the biking on the high mountains, camping in lush valleys, vistas of picturesque landscapes along with spectacular and surreal panorama and leave your marks on the mighty Himalayas. An envoy from Travel Myntra team will receive you at the boarding point of the Luxury Volvo Coach for your overnight journey to Manali. Our envoy will ensure that you are comfortably seated in the coach. Enjoy travelling through the spectacular countryside and relish the natural beauty. An envoy from Travel Myntra team will receive you on your arrival at Manali and will ensure that you are comfortably picked-up and transferred to the Hotel pre-booked for you. Day till lunch is free to take rest, after Lunch attend an orientation regarding bike and biking skills on the high mountains. Later pick up the monster machines of your choice from different ranges of Royal Enfield (Classic, Electra, Thunder Bird) or Harley Davidson and take a short tour to the nearby places to get acclimatize with the machine. During evening explore the Best places to visit in Manali and enjoy your dinner at the cosy ambience of your hotel and relax. Enjoy an early morning breakfast and get ready to bump into the first and most exigent route towards Rohtang Pass. Your Explore Ladakh by Bike Tour actually starts from this point. The passage to Rohtang Pass is sprinkled with extravaganza in it background that calls over thousands of enthusiastic bikers every year from all over the world. During the ride you will pass through many small yet petite villages and the popular places like Rohtang Pass and Keylong. On your arrival at Jispa, settle yourself at the hotel pre-booked in your name and retire for the day. Enjoy Dinner at the cosy ambience of your Hotel relax. Enjoy your breakfast and proceed for another thrilling experience towards Pang. During today's ride you will drive through the one of World's High Mountain passes like Baralacha La Pass and the important stopover points like Sarchu. Today's ride will take you to the first phase of Ladakh, popularly called as the 'Land of High Passes' and a fascinating place in the in the lap Himalayas. Ladakh is beautifully guarded by the mighty peaks and is a bliss for the thrill and adventure lovers. On your arrival at Pang, settle and heal the exhaustion in the cosy ambience of your room. Enjoy the dinner and relax. Enjoy your breakfast and get set for another daring experience as you would drive to Leh today. This ride will take you to the World's Second Highest Motorable Road i.e. Taglang La Pass and would also allow you to see the graceful monasteries with colourful flags all over along with monks in the red setup. Leh was an important trade routes along with Indus Valley between Tibet to the east and Kashmir to the west. Leh is adorned with lush greenery and sprinkled with cool breeze. On your arrival at Leh, get relaxed in the warm ambience of your room and enjoy the sumptuous dinner. After driving for a long way the day has been kept free for you to relax and explore the Best Tourist Attractions of Leh, the second largest city of India. Leh is also called as heaven on the earth and is festooned with picturesque beauty, majestic snow capped Himalayas, lush green countryside and stunning water bodies. It is a paradise where you can rejuvenate, revitalize and delight your senses. During the day you will Explore the Best Tourist Attractions of Leh like Hall of Fame, Peace Pagoda (Shanti Stupa), Jama Masjid, Leh Palace, Namgyal Tsemo Monastery and Stok Palace. Enjoy shopping at the famous Leh market which is famous for beautiful ornaments and mementos. After an enlivening day, get retired at the comfy environment of your Hotel and relax. Enjoy an early breakfast and get set for a thrilling Bike Tour to Pangong Tso Lake, one of the Most Popular Places to visit in Leh. The Bike Tour to Pangong Tso Lake offers an adventurous experience with picturesque landscapes. Pangong Tso Lake is nestled at a high altitude and drive to Pangong Tso Lake demands to pass through high passes like Chang La Pass and Tangtse. On your arrival at Pangong Tso Lake feel the serenity near the calm water of the gorgeous lake and capture the charming views of the nature's splendour. Pangong Tso Lake is a beautiful and crystal blue water lake and offers pleasant weather throughout the year. Later check-in at the resort pre-booked for you and get relaxed in the warmth and homely environment. Enjoy your breakfast and stroll for sometime around the beautiful Pangong Tso Lake to capture the picturesque beauty. Later leave for Leh and en-route visit the Hemis Monastery, Thiksey Monastery and Shey Monastery as these amongst the Best Monasteries of Leh and Ladakh. On your arrival at Leh get relaxed in the comfy ambience of your room and prepare yourself for the next day drive. The time has come to head towards Manali. Enjoy your breakfast and buckle up for a ride whipping towards a lush green vistas. Sarchu is a perfect place for overnight stay while drive to Leh or vice versa and is a treasure trove of exquisiteness. The place offers views of the majestic mountains and stay for overnight Luxury Camping in Sarchu is an inexplicable and dreamlike experience. On your arrival at Sarchu, proceed to the luxury tent pre-booked in your name for your overnight stay. Enjoy a clear sky and see the sparking stars you would see on a single night. Enjoy an early breakfast and hit the road towards Manali. This exceptional ride is the last phase of your Bike Trip to Leh. Today you will drive through Jispa, Lahaul range, Rohtang Pass and many magnificent spots. By evening you would arrive in Manali. On reaching Manali, get settled at the hotel pre-booked for you. After dinner enjoy a sound sleep and kick-off the tiredness of this endearing expedition. Before departing from Manali, enjoy Manali Sightseeing Tour and visit the Best Places to see in Manali such as Hadimba Temple, Manu Temple, Tibetan Market and the famous Mall Road of Manali. After lunch, you will be picked up by Travel Myntra envoy from the reception of your Hotel and will be assisted in your transfers to the boarding point of the Luxury Volvo Coach for your onward journey. 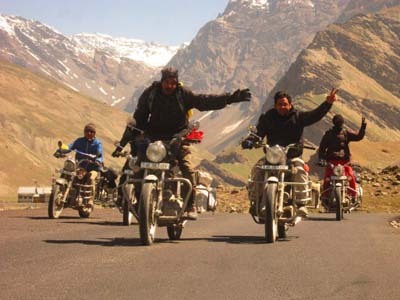 Your Explore Leh Ladakh by Bike Tour ends here with fun thrilling memories. Lahaul and Spiti, located in the North Indian state of Himachal Pradesh is a huge district and.. The tour simply gratifies a Biker's dreams which is to bike through the exhilarating terra..